Are Odisha iron ore miners operating as a cartel? India’s ministry of mines has directed its advisory body—Indian Bureau of Mines (IBM)— to look into an alleged case of artificial low supply of iron ore and cartelisation by some Odisha-based miners to domestic pellet manufacturers. 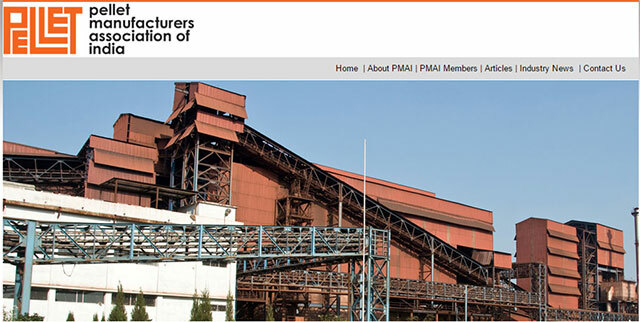 The IBM has been asked to conduct an investigation on the basis of a 25 February complaint by the Pellet Manufacturers Association of India (PMAI), a lobby group. The Bureau is expected to submit its report within a fortnight to the government. Iron ore pellets are utilized for steel production. India’s iron ore production for FY16 is estimated at 135 million tonne compared with 129 million tonne in FY15. “We have asked the Indian Bureau of Mines to examine the matter and issue necessary directions to the Odisha government and private miners in order to resolve the problem,” India’s mines secretary Balvinder Kumar told VCCircle. 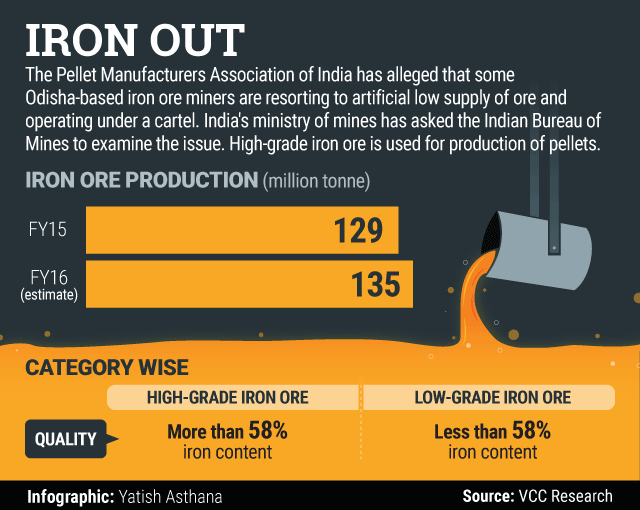 The pellet industry has argued that merchant miners are producing iron ore below par which may have severe financial implications on the industry. Odisha’s pellet industry has a production capacity of 30 million tonnes per year. High-grade iron ore is used to manufacture pellets. Interestingly, India’s ministry of mines plans to approach the finance ministry seeking a cut in export duty on high-grade iron ore to 10% from 30% at a time when international prices are firming up, as reported by The Financial Express newspaper on 4 March. “With a slump in the steel market and availability of global supply of iron ore due to lower international prices, there has been a pressure on margins of domestic iron ore miners, and costs tend to be relatively inelastic. Hence, the urge to protect prices through limiting domestic supplies may be high,” said Dipesh Dipu, partner, Jenissi Management Consultants, a consultancy firm focusing on energy and resources. The PMAI is also pitching for e-auction of iron ore in Odisha on a transparent platform, a process adopted by other states, including Karnataka and Goa, to prevent the practice of cartelisation and leading to fair price emerging from auctions. “Directives should be given to the miners to produce up to environment clearance limits. At any rate, even if this is not possible, the concept of minimum production requirement, as is now being enforced in the case of new leases granted by auction, should also be imposed upon the miners,” stated PMAI in a representation to the ministry reviewed by VCCircle. A PMAI spokesperson did not respond to queries emailed on 9 March. "We have received correspondence from the ministry of mines and have started investigation," said R.K. Sinha, controller general, Indian Bureau of Mines. Experts believe that given the current scenario of the industry, possibility of cartelisation can’t be ruled out. “Due to the stress on steel and thereby on iron ore markets, there are chances that cartelization may occur resulting in non-competitive behaviour and implied higher prices than otherwise likely to be observed in the market,” said Dipu. He added that in case any such practice is proved, it is advisable to investigate and take corrective measures to align participation in the market on free market principles. India’s consumption of finished steel was 76.99 million tonnes for FY2015-16 driven primarily by infrastructure creation in railways, roads and highways, and the auto industry. The country has been a net importer of steel with the exception of FY2013-14 when it bucked the trend. “The investigation may take place under the ambit of the Competition Commission of India, and these investigations typically tend to rely on statistical analysis of pricing data and market behaviour of the players,” added Dipu. Note: The story has been republished with corrected information.